We’d love your help. Let us know what’s wrong with this preview of Shadows of the New Sun by J.E. Mooney. In this volume, a select group of Wolfe’s fellow authors pay tri Perhaps no living author of imaginative fiction has earned the awards, accolades, respect, and literary reputation of Gene Wolfe. His prose has been called subtle and brilliant, inspiring not just lovers of fantasy and science fiction, but readers of every stripe, transcending genre and defying preconceptions. To ask other readers questions about Shadows of the New Sun, please sign up. Shadows of the New Sun is a collection of stories inspired by Gene Wolfe's work and the author's fond memories of meeting Gene (or not). Official Business: I got this from Netgalley. Thank you, Netgalley! The authors included are Neil Gaiman, David Brin, David Drake, Nancy Kress, Timothy Zahn, Michael Stackpole, Aaron Allston, Michael Swanwick, Mike Resnick, and others. Neil Gaiman's story, the Lunar Labyrinth, is my favorite. 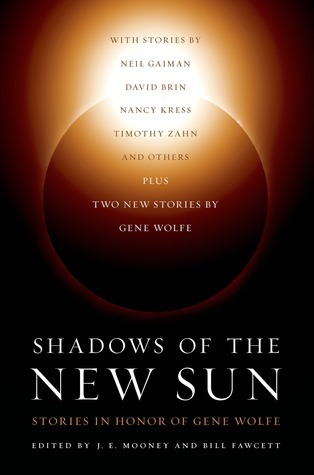 Timothy Zahn's story and Frostfree, the tale of a refrigerator that tra Shadows of the New Sun is a collection of stories inspired by Gene Wolfe's work and the author's fond memories of meeting Gene (or not). The authors included are Neil Gaiman, David Brin, David Drake, Nancy Kress, Timothy Zahn, Michael Stackpole, Aaron Allston, Michael Swanwick, Mike Resnick, and others. Neil Gaiman's story, the Lunar Labyrinth, is my favorite. Timothy Zahn's story and Frostfree, the tale of a refrigerator that transforms into a woman and gives a man love advice, were tied for second place. I was totally pumped when I found out this anthology was going to exist. For a lot of reasons, really. Wolfe is pretty close to being my favorite author (I've read all of his books, and most of the better ones twice), and seeing a whole anthology in tribute to him is just... fitting. And awesome. Of course, it also sets a really high bar. The whole anthology is inevitably going to be in Wolfe's shadow, but with a roster made up of successful, sometimes bestselling authors (a lot of them make mor I was totally pumped when I found out this anthology was going to exist. For a lot of reasons, really. Wolfe is pretty close to being my favorite author (I've read all of his books, and most of the better ones twice), and seeing a whole anthology in tribute to him is just... fitting. And awesome. Of course, it also sets a really high bar. The whole anthology is inevitably going to be in Wolfe's shadow, but with a roster made up of successful, sometimes bestselling authors (a lot of them make more money than Wolfe, I'm guessing, despite the weight of his reputation and importance to the field) it has to be okay, right? I think this is partially because (with the exception of Swanwick, who wrote the insanity that was Stations of the Tide) a lot of the authors do relatively conventional work themselves. So to start out they're working in pretty unfamiliar territory. Though I should also mention there were a few stories so amazing I think the anthology is definitely worth reading anyway. There are basically three kinds of stories in the anthology. Ones that have nothing to do with Wolfe except for maybe being in the same genre (all average or mediocre somehow, though they didn't have to be, just bad luck I guess); others that draw from certain elements and just go from there; and then what I'd basically call Wolfe fanfiction, but written by professional authors. Surprisingly, they tended to borrow from Wolfe's short stories more often from his novels, but generally there's a pretty even balance. I was thinking of reviewing each story individually, but instead I think I'll just focus on a few that really stuck out to me. All of them are pretty easily five stars, and some of the best short fiction I've read this year. Just phenomenal. The only story to engage with every element of Wolfe's writing, while sort of creating a parallel version of The Fifth Head of Cerberus. Brilliantly conceived and written; probably worth buying the collection on its own. I've read a few of Swanwick's books before but this story made sure I'm going to go back sometime soon. Like Swanwick, Nye comes very close to Wolfe, with a story about the Nessus Witch guild that takes place after the Book of the New Sun, concerning a search for Severian's memoirs... so, the text of the Book of the New Sun. It's very well written, phantasmagorically imagined, and does a great job exploring a neglected part of Wolfe's world. I looked up Nye after reading the story, and her other work doesn't seem as strong, but interestingly it seems to be made up mostly of additions, collaborations, and mimics of other author's work, which shows an amazing range and deftness. Ironically the Wolfe stories were solid, but not his best. I think Wolfe writes maybe the best novellas in the English language, but his short fiction is hit or miss, and there are better ones in most of his collections. Anyway, I think there's a lot of disappointing work in this collection but it's pretty much mandatory for Wolfe fans anyway, and I'm really glad I read it. It's worth wading through the less impressive pieces to get to the good, because the good pieces are VERY good. If you love Gene Wolfe, read this book. If you don't know who Gene Wolfe is, or if you haven't yet gotten around to reading his stuff, don't read this book. Read his stuff. Because, consider: for what other contemporary science fiction and fantasy author could you publish an anthology with original contributions by such well-known and respected names all somehow influenced by and tributing him? Even if you don't believe all your nerdy and literary friends about how great Gene Wolfe is, you shoul If you love Gene Wolfe, read this book. If you don't know who Gene Wolfe is, or if you haven't yet gotten around to reading his stuff, don't read this book. Read his stuff. Because, consider: for what other contemporary science fiction and fantasy author could you publish an anthology with original contributions by such well-known and respected names all somehow influenced by and tributing him? Even if you don't believe all your nerdy and literary friends about how great Gene Wolfe is, you should believe Gaiman and Brin and Haldeman and Zahn. That said, I only gave the anthology two stars. As much as I wanted to like every story in here, I was less than impressed by many of them. It's probably not fair to compare them to Wolfe's own stories (the anthology is Shadows of the New Sun, after all), but I couldn't help it. A story written about Severian by someone other than Wolfe? Someone else trying to play with myth and allegory in a Latro tale? A view of Ushas through non-Wolfean eyes? They felt flat to me. Even Gaiman's contribution was a bit of a disappointment. I would also have enjoyed hearing more about Wolfe's life and influence; the introductory paragraphs before each story weren't enough, especially when each story was followed by author bios two or three times as long. Originally reviewed at Reading Reality. He’s generally acknowledged by other SF and fantasy authors as a writer’s writer, so it is appropriate that so many of them have joined together in this festschrift edited by J.E. Mooney and Bill Fawcett Originally reviewed at Reading Reality. He’s generally acknowledged by other SF and fantasy authors as a writer’s writer, so it is appropriate that so many of them have joined together in this festschrift edited by J.E. Mooney and Bill Fawcett. As with any collection of short stories, some are stronger than others. Many of the ones I liked best play with the boundaries between an author and the characters he or she writes. For example, “Epistoleros” by Aaron Allston is epistolary in form and set in an alternate world where the Republic of Texas remained a going concern through the 1890s, along with many of the colonial territories of North America. The twist at the end, where an author/reader turns the tables on a character, is sure to please fans of Jasper Fforde. Along parallel lines, “… And Other Stories” by Nancy Kress shows that sometimes it’s not enough to get lost in a good book, but to figure out how to escape into one. “Ashes” by Stephen Savile is a quiet meditation on love lost and making time to travel one’s memory in the course of grief. “Tunes from Limbo, But I Digress” by Judi Rohrig is a fun tale told by an unreliable narrator — unreliable in part because the narrator isn’t entirely certain of her identity. “A Touch of Rosemary” by Timothy Zahn and “Snowchild” by Michael Stackpole are solid fantasy tales, while “The She-Wolf’s Hidden Grin” by Michael Swanwick is an example of the most excellent sort of horror story that hits the reader even harder an hour after reaching its end. Competent but unexceptional contributions include “A Lunar Labyrinth” by Neil Gaiman, “In the Shadow of the Gate” by William C. Dietz, and “The Log” by David Brin. Among the weaker contributions was “Tourist Trap” by Mike Resnick and Barry Malzberg. Recent events may be coloring my impression of this story, but I was put off by its use of the trope of stuffing a female character into a figurative refrigerator. “Soldier of Mercy” by Marc Aramini tried a bit too hard to match the complexity of Wolfe’s writing, but ended up just leaving me feeling a bit confused. Also included are two stories by Wolfe himself, “Frostfree” and “Sea of Memory”. There were a couple gems in here, certainly. There were a few stories that did honor to a great writer by being great themselves. But the others were inspired by Gene Wolfe the same way Modest Mouse was inspired by Pixies. A mixed bag. Turns out writing short stories in Gene Wolfe mode is difficult to do! The authors who already write Wolfean work are good (Michael Swanwick's story alone is worth the price of admission), those who don't either don't bother trying or confuse "make Gene Wolfe reference" with "write Gene Wolfe-esque story." Great, if you love Wolfe. What I found the most interesting was the last 20% of the book which consisted of articles on writing, SF/F, and other things, by Mr Wolfe. The other 80% are interesting interviews, interesting except for the expected overlap in some of the various interviewer's questions to Wolfe over the years. Originally published at "The Nameless Zine". Check it out for more reviews. Gene Wolfe is a writer’s writer. That’s not to say readers can’t enjoy his dense, cryptic tales like the epic “The Book of the New Sun”, but his real champions are his fellow authors - which helps explain his shelf of awards combined with his relative obscurity. In Shadows of the New Sun, editors Bill Fawcett and J.E. Mooney gather 16 of the best living sci-fi and fantasy authors — including Neil Gaiman, David Brin, Joe H Originally published at "The Nameless Zine". Check it out for more reviews. In Shadows of the New Sun, editors Bill Fawcett and J.E. Mooney gather 16 of the best living sci-fi and fantasy authors — including Neil Gaiman, David Brin, Joe Haldeman, Nancy Kress and Michael Swanwick — to pay tribute to Wolfe, sharing memories as well as original stories inspired by Wolfe’s award-winning work. Additionally, the collection features two new stories from Wolfe himself — “Frostfree”, a tale of a sentient, shape-changing refrigerator sent from the future to help a cold-hearted appliance salesman; and “Sea of Memory”, a beautiful story of space travelers emerging from suspended animation on a distant planet where time and place may not be all they seem. But while the assorted reminiscences of encounters with the jovial, mustachioed Wolfe at conventions are filled with adoration and no small degree of awe, many of the stories fall flat. Gaiman, arguably Wolfe’s biggest champion, offers “A Lunar Labyrinth,” a werewolf tale where the only connection to Wolfe seems to be the play on his surname. Better was Timothy Zahn’s “A Touch of Rosemary,” the story of a wizard who helped a cook make magic through the addition of the titular herb to her recipes. The little tale, a tribute to Wolfe’s wife Rosemary, became more poignant with her passing, shortly after this anthology was published last year. Other authors attempted to examine Wolfe’s most famous works in ways that felt almost like fan fiction. Again, this yielded mixed results. Swanwick’s “The She-Wolf’s Hidden Grin” is the finest entry in the collection, a chilling, alternate vision of Wolfe’s 1972 novella “The Fifth Head of Cerberus.” But William C. Dietz’s “In the Shadow of the Gate,” which gives a different perspective on Severian, the infamous torturer/narrator of Wolfe’s “Book of the New Sun,” disappointed. Severian is such an iconic character and “New Sun” is such a classic, the entire story felt wrong. Haldeman and Kress take a meta-look at Wolfe’s award winning “The Island of Dr. Death and Other Stories” in their respective offerings: “The Island of the Death Doctor” and “… And Other Stories.” Haldeman’s tale features a reader meeting a variety of Wolfe’s characters and inspirations, including Severian and Holden Caulfield, as well as Wolfe himself. Kress’s story follows a girl who is condemned by her witchy grandmother to slave labor, trapped within classic novels, and is only able to escape by entering Wolfe’s story. Steven Savile’s “Ashes,” in which a young man whose bride-to-be had recently died relives memories of his time with her during a magical journey through Europe was another highlight. Unfortunately, the rest of Shadows of the New Sun barely registered. Michael Stackpole’s “Snowchild” was probably my favorite of the rest, and “Tourist Trap” by Mike Resnick and Barry Melzberg was easily the worst of the lot, otherwise the remainder of the stories didn’t stay with me. Gene Wolfe is an author worth reading, albeit an often difficult one. My own steps into his deep oeuvre are still shallow and his dense writing is incredibly intimidating. But while Shadows of the New Sun may not be the perfect introduction to his work, even the weaker ones piqued my interest in discovering the stories that inspired them. I'm tempted to give this book a five-star rating because of how excited I get over it, but looking back over the stories proves to me that the majority of the stories only got four stars. Frostfree, the opening story by Gene was better than average, but sub-par for him. Still, it was a memorable and fun story about a possible future AI/appliance. Gene's second story, the last one in the collection, was one of the best. Given his penchant for unreliable narrators, you know a story titled "Sea of Me I'm tempted to give this book a five-star rating because of how excited I get over it, but looking back over the stories proves to me that the majority of the stories only got four stars. Gene's second story, the last one in the collection, was one of the best. Given his penchant for unreliable narrators, you know a story titled "Sea of Memory" is going to be a doozy. This one didn't fail. I know I'll be returning to it catch things I missed. Multiple times while reading it, I marveled to myself at his mastery of the craft. The other stand-out story was the offering from Nancy Kress. Her stories continue to impress me, and this is the only one where Gene stands out to me as a character wonderfully portrayed. The setting evoked the Doctor Death stories. Zahn and Gaiman paid honor to Rosemary, which was sweet, though more surprising from Zahn, whose work I haven't read since his Thrawn trilogy. Whereas most entries fit the homage role, Brin's was one of perhaps two that seemed to combine original work with Wolfe's. In this case, Brin's uplift elements blended well with ideas from The Solar Cycle. Brin's mastery also shone through on top when he was able to make an idea I don't agree with come across well in an interesting way. There were a few clunkers in this collection, but only a few. Most of the stories that felt flat were better than average and only suffered because of what I compared them to. There are many stories here I'll be coming back to. It has taken me a while to finish Shadows of the New Sun, a collection of stories written as a homage to Gene Wolfe. It has taken me a while because in the process I have reread most of his short story compilations and I even was sorely tempted to reread the Book of the New Sun. I still may do it. I seldom buy mixed author compilations because it is a shotgun approach to quality (all over the place), but considering my own completeness fixation with Wolfe and that it is unlikely these stories wi It has taken me a while to finish Shadows of the New Sun, a collection of stories written as a homage to Gene Wolfe. It has taken me a while because in the process I have reread most of his short story compilations and I even was sorely tempted to reread the Book of the New Sun. I still may do it. I seldom buy mixed author compilations because it is a shotgun approach to quality (all over the place), but considering my own completeness fixation with Wolfe and that it is unlikely these stories will be published elsewhere, I went in. Wolfe does not really write in a genre, he writes of wondrous things in all genres, how that wonder gets into current, or fantastical, or future life. That was the real challenge for the contributors, to evoke that sense of wonder. This is an anthology that is a tribute to Gene Wolfe. And though each author has it's own way of writing, and writing style, I think it's awesome that each of these stories was a tribute to him. And besides these stories were great! Of course some I liked more than most, but I still enjoyed this anthology and just for that alone, I think it's worth the read! Aaron Allston, Ep This is an anthology that is a tribute to Gene Wolfe. And though each author has it's own way of writing, and writing style, I think it's awesome that each of these stories was a tribute to him. And besides these stories were great! Of course some I liked more than most, but I still enjoyed this anthology and just for that alone, I think it's worth the read! Aaron Allston, Epistoleros: think parallel western and somewhat of star wars. Judy Lynn Nye, Dreams of the Sea: this one is about the Nessus witches and the search of Severian's memories. this one is definitely unique. I'm not very familiar with Gene Wolfe's body of work. I expected more out of this book - this compilation reminded me of another anthology, done in honor of Jack Vance, who I also hadn't read. I fell in love with that anthology and it sent me on the hunt for more of Vance's work. I was hoping Shadows of the New Sun would do the same; that's why I requested a free copy for review from NetGalley. Two of the stories in this anthology were written by Gene Wolfe and it's those two stories that compel I'm not very familiar with Gene Wolfe's body of work. I expected more out of this book - this compilation reminded me of another anthology, done in honor of Jack Vance, who I also hadn't read. I fell in love with that anthology and it sent me on the hunt for more of Vance's work. I was hoping Shadows of the New Sun would do the same; that's why I requested a free copy for review from NetGalley. Two of the stories in this anthology were written by Gene Wolfe and it's those two stories that compel me to seek more of his work. The stories that I liked, I really liked: Steven Savile's Ashes; Nancy Kress's ...And Other Stories; and Jack Dann's The Island of Time. I had problems getting into a few of the stories but I strongly suspect it's because I'm not familiar with Wolfe's worlds. The first story remains my favorite so far. "Frost Free" tells the story of a refrigerator sent back in time to break a curse. It seems much more plausible when Wolfe writes it, honest. It is interesting to think that there are some authors who rock our world so much that people want to write stories in their honor. While I found the stories themselves somewhat a mixed bag, I was moved by the desire to do homage to Gene Wolfe, not only as an author but as a person. These people had stories about a humble gracious man who did not set himself on a pedestal, but sought to share the joy of writing with as many people as possible. If you haven't picked up Wolfe, I'd urge you you to It is interesting to think that there are some authors who rock our world so much that people want to write stories in their honor. While I found the stories themselves somewhat a mixed bag, I was moved by the desire to do homage to Gene Wolfe, not only as an author but as a person. These people had stories about a humble gracious man who did not set himself on a pedestal, but sought to share the joy of writing with as many people as possible. If you haven't picked up Wolfe, I'd urge you you to start with a short story collection and furrow your brows a bit. Its a good ride. A nice collection of stories written in honor of Gene Wolfe, and the author himself. As other reviews have noted, Wolfe sets a very high bar. With one exception, the stories that borrow from his works suffer in comparison. Of the rest, "Ashes" by Steven Savile was by far my favorite. I expect this book would appeal mostly to existing Wolfe fans, though it would certainly be enjoyed even by those unfamiliar with him. A great collection honoring Gene. The introductions to each story were nice to read. Some stories were better than others. I won't go into as much detail as some of the others here, but I will say that I particularly felt Jody Lynn Nye's story captured the essence of Urth, and that William Dietz's jarringly did not. His was the one story that felt so wrongly placed with the others. The two felt so juxtaposed. I enjoyed Joe Haldeman's story, and Nancy Kress. I love a good collection of short stories and when those stories introduce me to authors I haven't read, or re-introduce me to authors I have read and loved, I'm a happy, happy girl. Especially when said stories are science fiction and fantasy. That's what Shadows of the New Sun is full of so you can imagine I was over the moon when I received a copy of this book. Read the rest of this review at The Lost Entwife on September 28, 2013. A worthy collection to honor Gene Wolfe. My favorite stories in the collection are Timothy Zahn's "A Touch of Rosemary", "Ashes" by Steven Savile, Jack Dann's "The Island of Time", Aaron Allston's "Epistoleros", and Wolfe's own "The Sea of Memory". Neil Gaiman's story, "A Lunar Labyrinth," was good, but somewhat disappointing. An interesting collection. I haven't read all that much by Gene Wolfe, but the list of author's in this compilation was too alluring. They cover the whole spectrum, and show a great amout of absurdity. I've gathered different understanding of these authors as well. I love reading how they're inspired and how that is converted into their own creativity. This is an anthology of stories in honor of Gene Wolfe. Some are pretty good, some are okay. One or two of them really sound like Gene Wolfe. But probably the best story was the first one, by Mr. Wolfe himself, about a magic refrigerator. I don't know how he lives with himself. Most of the stories are pretty much total crap, but there are two by Gene Wolfe, one of which is pretty great (frostfree) and the other of which is ok. 1 star for the rest of the book, 4 stars for those 2 stories, 3 stars total. Yep. Most of these stories were based on books by Gene Wolfe. I've never read anything by him, so they didn't make much sense. But Ashes by Steven Savile and A Touch of Rosemary by Timothy Zahn were both excellent. I enjoyed many of these stories, although only a few actually reminded me of Gene Wolfe's books and a couple were incomprehensible to me. This collection has made me want to read more Gene Wolfe, and I will check out a few of these author's other works. As with any short story collection, I liked some more than others. And I discovered a couple new authors to try.